Tea, coffee, cola and chocolate all contain caffeine, which acts as a stimulant and can interfere with the absorption of certain nutrients when you get large amounts in your diet. People with iron deficiencies are often advised to avoid caffeine due to its potential to reduce iron absorption. 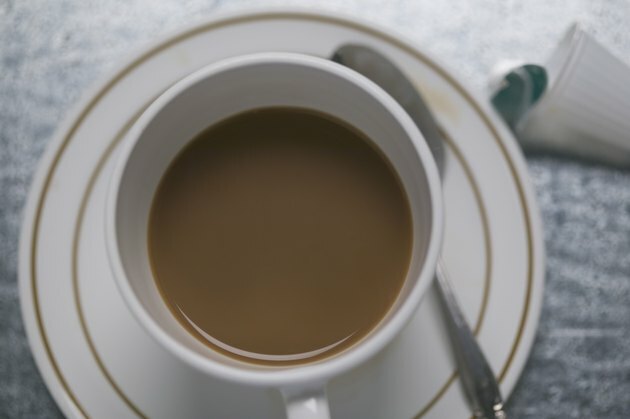 Most Americans get plenty of iron in their diet, however, and don't need to worry about avoiding beverages containing caffeine, such as coffee, according to the Centers for Disease Control and Prevention. A study published in "Food Chemistry" in 2004 found that caffeine only binds about 6 percent of iron -- a relatively small amount. The Office of Dietary Supplements notes that most Americans generally get enough iron from the food they eat, but women and young children sometimes have trouble meeting their iron requirements. These people may want to minimize their caffeine intake to lower their risk for iron deficiency. Caffeinated beverages, such as tea and coffee, only decrease the absorption of iron from plant foods, called nonheme iron, and not the iron from animal-based iron sources, called heme iron. Nonheme iron is already less absorbed by the body -- up to 18 percent of iron from diets including meat is absorbed, but only 5 percent to 12 percent of iron from vegetarian diets is absorbed, notes the Office of Dietary Supplements. Some caffeinated foods and beverages also contain substances other than caffeine that interfere with iron absorption, such as the tannins and polyphenols found in tea and the chlorogenic acid found in coffee. Drinking coffee lowers the absorption of nonheme iron at the same meal by about 35 percent, but drinking tea can lower the absorption by up to 62 percent, according to a study published in "Human Nutrition, Applied Nutrition" in 1982. Drinking these beverages at different times from eating foods containing iron will limit any effects on iron absorption. If your iron levels are low, eating iron-rich foods along with a source of vitamin C, such as oranges; eating animal-based iron-rich foods at the same meal as plant-based sources of iron; and not eating foods high in fiber or calcium at the same time as iron-rich foods can all help increase your iron absorption. Substances found in legumes and grains, including phytates and certain polyphenols, may decrease iron absorption as well. This doesn't mean you need to totally avoid these nutritious foods -- just eat them at a separate time from the major sources of iron in your diet if you find yourself with low iron levels. Consumer Reports: Q&amp;A: Are Coffee and Tea Iron-Blockers? Food Chemistry: Does Caffeine Bind to Metal Ions? Does Vitamin C Increase Iron Absorption? Do You Absorb the Minerals From Fortified Cereals?